On June 27, 2016, City Council approved changes to landscaping requirements for all new low density residential development and introduced incentives for preserving mature trees and shrubs with the adoption of Bylaw 17672. Mature trees play an essential role in the environmental quality and biodiversity of the city, and contribute to the livability of our neighbourhoods. Diverse, attractive landscaping and plant material on private properties also reinforces the unique community character of existing mature neighbourhoods, and helps reduce the visual impact of new development. The changes strive to balance development opportunities with community desires for installation of new landscaping that complements surrounding mature vegetation and retention of existing mature trees and shrubs on infill sites. Amendments were approved by City Council and came into effect on June 27, 2016 (Item 3.10). Landscaping requirements remain unchanged in the following low-density zones: RPL, RPLt, RF4, RF4t, RMD, UCRH, CCLD, CCSF, HVLD, GHLD. 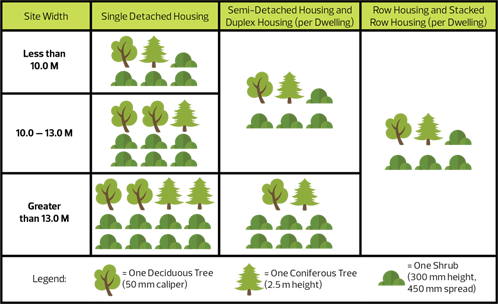 All new low-density residential development in all other zones, such as the RSL, RF1, RF2, RF3 zones, are now required to plant trees and shrubs according to the table below. Trees and shrubs are to be listed in text on the site plan in a legend, and plant locations do not need to be shown on the site plan. This is so that future homeowners can have flexibility in the ultimate location of the trees and shrubs. The City of Edmonton has introduced an incentive program promoting the retention of existing mature trees during construction. Any new development can receive credits towards their tree requirements for preserving mature trees. The table below describes the minimum size trees and shrubs required to receive credit for one or two new trees. To encourage these good construction practices and provide information on initiatives to preserve existing landscaping, a new Construction Site Management Acknowledgement Form is now required as part of all Infill Development Permit for low and medium density residential applications. Applicants are required to print, complete and sign this form and attach it with their Development Permit Application. This form will provide Infill Development Permit applicants, contractors, builders and property owners information about the City of Edmonton’s requirements and guidelines for best construction practices. Over one thousand people completed the surveys, providing in-depth and thoughtful responses that helped shape the amendments. Thank you to everyone who attended the open house on December 8, 2015. Tree and shrub planting requirements for low density residential development were previously limited to the RF4, RPL, RMD, UCRH and HVLD zones. For Single Detached Housing, Semi-detached and Duplex Housing in all other zones, landscaping was generally limited to seeding or sodding of front yards within 18 months of occupancy. As a result of the previous requirements, landscaping often varied from site to site, or was nonexistent. While trees on City property, such as boulevards and parkland, are protected under the Corporate Tree Management Policy C456A, the Alberta Municipal Government Act does not specifically authorize municipalities to protect trees on private property. The lack of municipal authority to protect trees on private property combined with an absence of incentives to retain mature trees, often leads to sites being cleared of existing trees and shrubs prior to construction, a practice that mature area communities have identified as a concern. An online reference guide has been created to provide an overview of the landscaping regulation changes and links to other useful tree planting and landscaping resources, such as a list of common tree species in Edmonton. Information on tree care and maintenance is available on the Trees and Urban Forestry page. More information on tree care and maintenance.